Cold, grey November days are on the way, so why not counteract that with some glittery gold that is such a popular scrapbook trend right now? That's exactly what the team over at Write.Click.Scrapbook.! did with the November Gallery theme: Glitter, Sparkle, Shine. 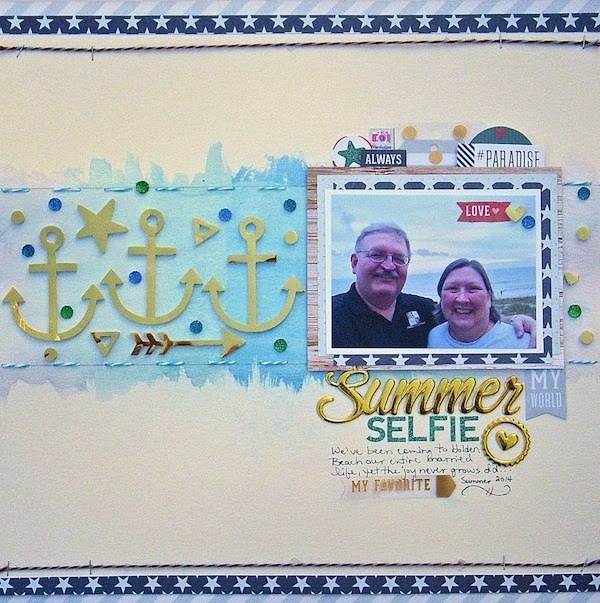 This layout takes me back to warmer weather and our summer vacation. Life is so good at the beach, and I wanted to capture that joyfulness with glitter, sparkle and shine! I painted a background band with ocean blue watercolors, then sewed and layered over top. You can find more inspiration from the rest of the team right here. Ah, Love the gold summer title and the glittery alphabet! The watercolor paint is brilliant! Aw! This couple is so good. The layout of your photo frame is too good as this attract me to place my summer selfie like this too. May God Bless u both and u take more selfie like this. Good blog!